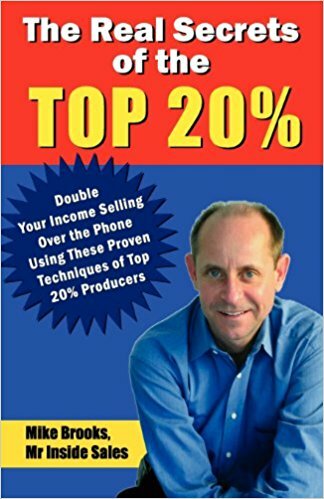 Mike Brooks has hit a home run with The Real Secrets of the Top 20%. This must read book is perfect for anyone who works in the sales profession, and it is destined to become a classic. Inside selling requires a special talent – instant rapport, believability, and a few secret ingredients to create a buying atmosphere. All these elements are revealed in in easy-to-master details within Mike Brooks’ book The Real Secrets of the Top 20%. If you mast the secrets of the top 20%, you’ll soon find yourself in the top 5%. If you do inside sales or prospecting, you will get specific what-to-say techniques in this book that will help you avoid no’s and put money in your pocket. It’s a must-have for your sales library.